WINNERS is a proud brand of the TJX Canada family. 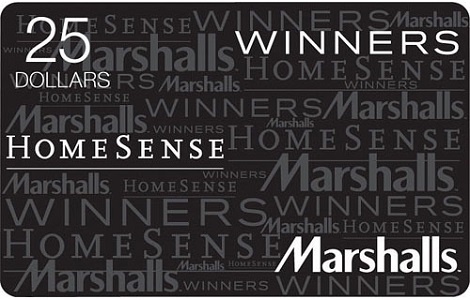 TJX Canada gift cards are redeemable at any WINNERS, HomeSense or Marshalls locations across Canada. One gift card to bring you the latest styles, brand names and designer fashions for yourself, your family and your home all at surprisingly low prices. Plus, we bring in thousands of new arrivals every week, so you’re sure to find something new and wonderful every time you visit. Find fabulous for less. Order your WINNERS gift cards today! Use of this gift card constitutes acceptance of the following terms and conditions. The card balance can be redeemed for merchandise only, at any WINNERS, HomeSense, or Marshalls store in Canada, cannot be redeemed for cash unless required by law, and cannot be used to pay a credit account. Items purchased with this gift card are subject to applicable store return policy. You can add to the balance of an active card at any time. For more information and to check card balance, please visit your local store. The value of this card will not be replaced if lost, stolen or used without permission. This card is issued by TJX Canada.